Hacienda Cerritos is a luxury 10-room villa on the edge of a private bluff overlooking the Pacific. An hour away from Cabo, the boutique luxury hotel is located near the little beach town of Pescadero. The hacienda itself is secluded and romantic, with spiral staircases, a secret passageway and a domed red rooftop overlooking the Sierra la Laguna mountains to the east and the Pacific Ocean to the west. This photo was taken during a day-after bride + groom session. This Vancouver celebrity bride wanted photos with lots of vibrant color that also incorporated the Baja landscape so we secured this special venue for their portrait session. This image is one of many favorites from our two hour photo session at the hacienda. I love the contrast of the bold reds and deep purples with the bride's light and airy feminine Vera Wang gown. With the negative space in the left two thirds of the space, the composition draws the eye to the couple's intimate interaction and the bride's simply radiant smile. 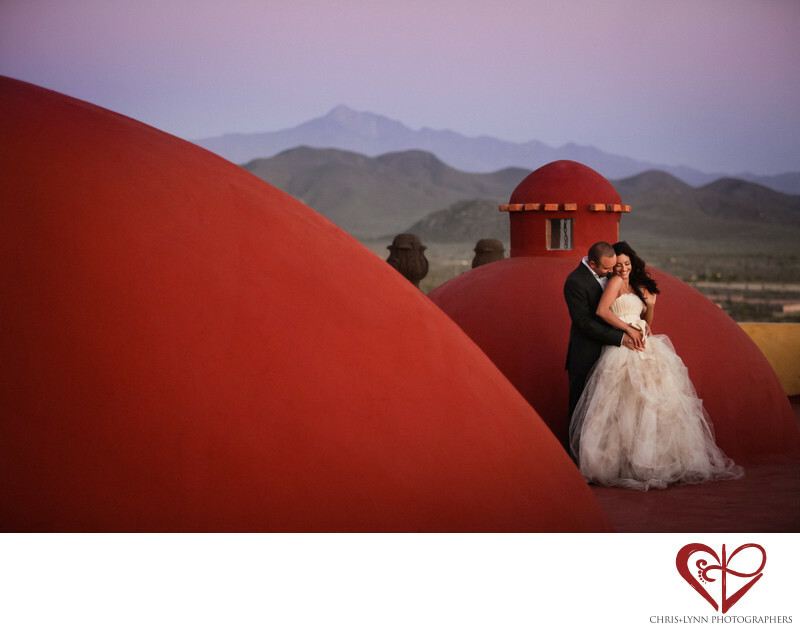 For us as Todos Santos wedding photographers, Hacienda Cerritos is the dream venue for a destination wedding in the entire Todos Santos area, if not all of Baja California Sur. Location: Hacienda Cerritos, Playa Los Cerritos, 23000 El Pescadero, Baja California Sur, Mexico. 1/160; f/2.8; ISO 800; 90.0 mm.